Back in 1967, Wham-O set aside their frisbees and hula hoops long enough to try publishing a comic book. 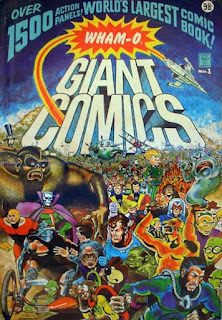 They produced Wham-O Giant Comics with the intention of it being an ongoing title, but it was cancelled after the first issue (probably in large part due to their inexperience with publishing, I expect). Despite it's only single issue run, it does hold a unique place in comics history. The book clocks in at 52 pages, giving it a lower page count than the "80-Page Giants" that DC had been publishing. However the "Giant" part of the Wham-O comic's name refers instead to the page dimensions: a whopping 14" x 21"! That's larger than most of IDW's Artist's Edition books. It includes work by comic legends like Wally Wood, Lou Fine, Ernie Colon, and John Stanley, and is billed as the "world's largest comic book" with "over 1500 action panels!" Ward Kimball, one of Disney's Nine Old Men, is listed as "faculty advisor" and contributed a short piece as well. What I was hoping to discover in digging around with this was why? Why would a toy manufacturer try their hand a comic book, and do one so obnoxiously large? As far as I can tell, none of the editorial staff had any previous (or subsequent for that matter) experience with comics. I've seen a couple suggestions online that posit, Wham-O was trying to cash in on the Batman craze instigated by the Adam West TV show, but I don't see any evidence of that frankly. The various comics included here are either gag strips or straight-up adventure stories; there's nothing reflective of the campy attitude from the show. Why the series wasn't continued seems obvious. 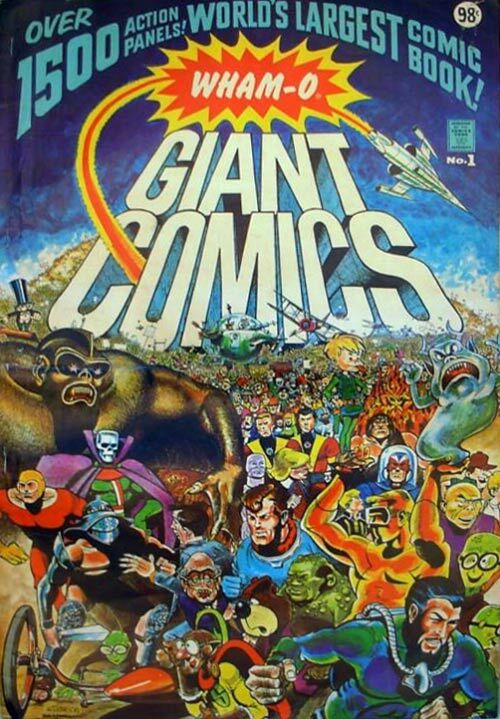 In the first place, most comics in 1967 cost 12¢ -- Wham-O Giant Comics #1 has a 98¢ price tag. Additionally, it's sheer size meant that it couldn't be displayed alongside other comics. I understand that Wham-O had to send out a custom display stand in order to hold these. Which was placed next to their frisbees and hula hoops, instead of anywhere near a newsstand. It would seem that retailers weren't willing to work with Wham-O on this at all, and a good many of them sat in a warehouse and were eventually sold off as bulk, to be sold in discount stores for half price. I had to pay $9.00 plus shipping for mine last year. The comics themselves are a bit of mixed bag, as with most anthologies. Even though their largest talents were considered past the primes, and not really draws in the comic industry, they still clearly had some solid storytelling chops. Not all of the stories are by those legendary creators, though. Still, it's a strangely curious artifact whose mere existence prompts any number of questions that I can't seem to find answers for. I may have some answers for your questions about Wham-O’s Giant Comics. My Dad, along with Spud Melin was a co-founder of Wham-O. I was around for the birth of the product and can share what I know. Why would Wham-O produce Comics? I may have had some influence as my tall stacks of comic books did not go unnoticed by my Dad. In other words, there was a market. In addition Dad’s brother in-law, William Anderson, worked for Walt Disney. Uncle Bill introduced Dad to Ward Kimball. Ward provided the introductions to the artists. Side note: Ward was a train buff and had a full sized locomotive in a train barn at the back of his property with a track ending at the front of the lot. He gave kids rides back and forth. He was similar to Spud and Dad; big kids who loved to have fun. Disney provides another reason. Spud and Dad noticed the connection between Disney media, films, TV, Comics and Theme Park, and the demand created for character toys. If Wham-O could publish a Comic that developed an audience, it would be a natural content marketing platform for a toy company. Spud and Dad were great at creative thinking. One of their techniques was to look at a product from extremes. What if it was miniature? What if it were huge? The other is they both grew up with fond childhood memories of spending Sundays sprawled out on top of the Sunday Newspaper Comics pages on the floor. Talk about immersive media! It was one-on-one, personal, and not just lean-forward media, it was plop-down media. It was partly the space issue, not fitting in to the newsstand area of stores and partly that Wham-O was a toy company and the buyers for the toy department were different than newsstand buyers. Store politics. Postscript: As their target customer, I loved the giant format because of the amount of content. I always hated getting to the end of a comic book. However, I admit I was disappointed by Wham-O’s because what I really wanted was Superman, Batman, Sgt. Rock, etc. Like any good storyline; it’s the characters you invest in. So glad your post popped up in my LinkedIn feed, Thanks! That is an awesome comment, Mr. Knerr! Thank you for sharing all this. Thanks very much, Chuck! Fantastic insights!